Are you looking online for brewery equipment financing? Do you want to get real information before picking up the phone? I mean, maybe it's just some joker who is fixing to lie to you, right? Total B.S., like "5% rates..."
... but not one word about what you care about. Kind of makes you want to have a beer (or four),no? Will You Qualify to Lease Brewery Equipment? 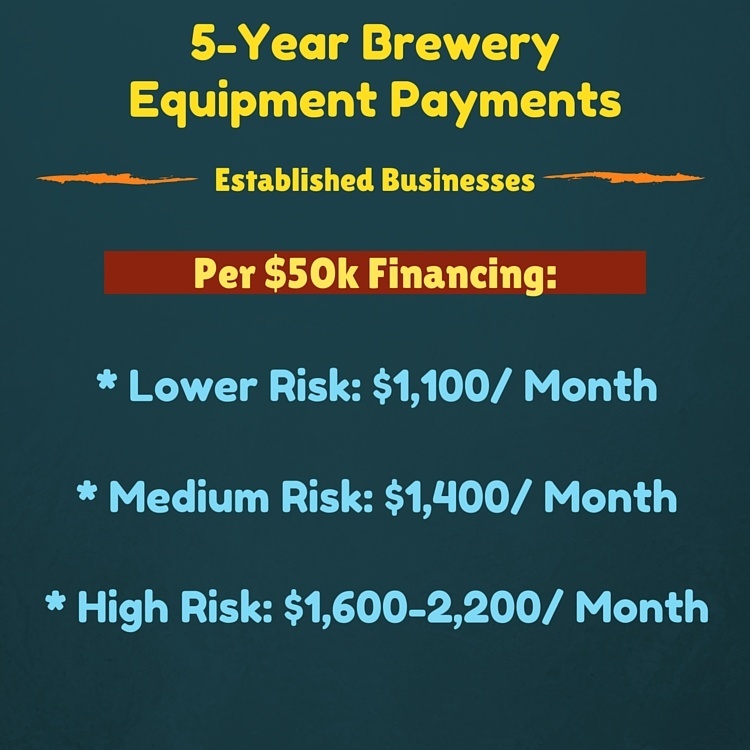 What do you really want to know about financing or leasing equipment for your brewery? Can you finance used brewery equipment? Let's start with the first question - will you qualify? If you are just starting a brewery business, it's much harder than for an established company. Let's go over how startups can fund their breweries and then we'll look at the rules for existing businesses. You will likely not be able to just waltz into your bank and walk out with money to finance a startup brewery. Startup financing for brewery equipment may be available to you though. Lower credit scores can sometimes be overcome with a larger down payment or some collateral (real estate or paid-off vehicles). Do you want to know the biggest problem for startups who want to lease brewery equipment? In a lot of cases, you're going to be very angry when you see the rates. Seriously, if the rates don't look kind of high when you're just starting out, you may be looking at a fake proposal. The rates vary, but lending to a brewery that's just starting out is pretty risky. Note - those payments assume you own the equipment at the end. In some cases, payment can be made lower by structuring the deal with a balloon payment at the end of the term. Riskiness is a combination of how good your credit is, how much money you are starting up with, and other factors. For super-well qualified borrowers, payments can sometimes be lower. 9 times out of 10, though, if payments are substantially cheaper than this, be triple sure you're not about to get jacked. Are Payments Lower When Established Breweries Lease or Finance Equipment? 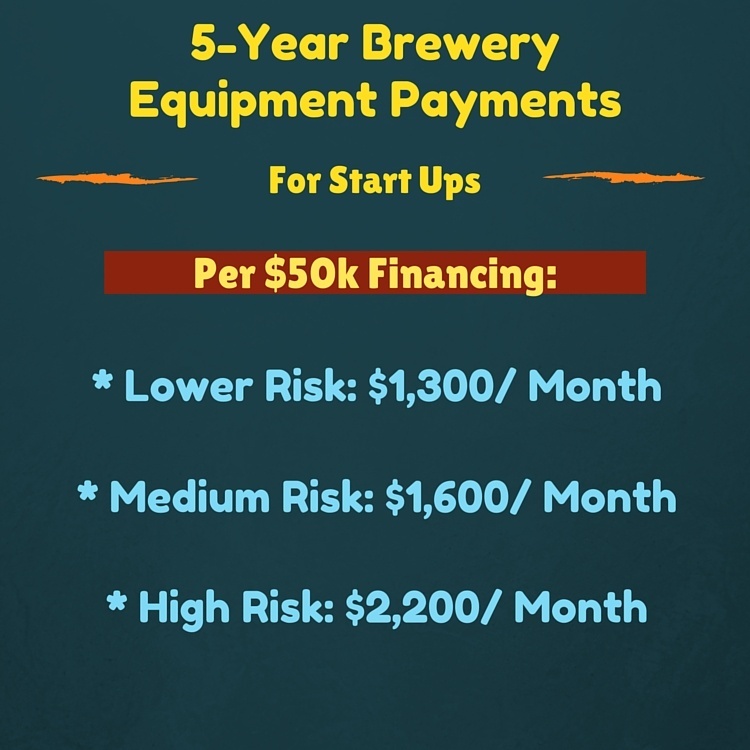 In most cases, you can qualify to finance more brewery equipment at lower rates. The payments can range from totally reasonable to way out. It really depends on how much risk the financier takes on. These payments can vary, as every situation is different. However, these should be a good approximation to get you started. Again, the above payments assume no balloon payment at the end. Often times, you want that balloon, for the tax savings. How Long Does it Take to Finance Brewing Equipment? The lower the dollar amount needed, the quicker the process is. On transactions under $75,000, approval can happen within hours. If all of your ducks (such as invoices and paperwork) are in a row, the process can be as fast as 2-4 days. On higher dollar transactions, the process could take a week or more. The biggest thing that tends to slow down the process is paperwork. A lot of times, when you are asking for $200,000 or more, you'll be asked for information such as personal financial statements, tax returns, etc. When you need to borrow a few hundred thousand dollars, there's going to be some underwriting involved, and it's going to take a little bit of work. What About Leasing Used Brewing Equipment? You can lease or finance used brewing equipment. You can also finance equipment purchased from a private party as opposed to a dealer. In general, equipment less than 10 years old is easy to get financed. You may have to have an inspector look at it to make sure it works, but that's about it. Equipment more than 10 years old is a little bit harder - but not impossible - to obtain financing for. Your rates may be a little bit higher when buying used brewery equipment - but not enormously higher. Smarter Finance USA can help you obtain Brewery Equipment Financing. To get a quote, call us at (866) 631-9996 or click on the picture below.